Hi there! 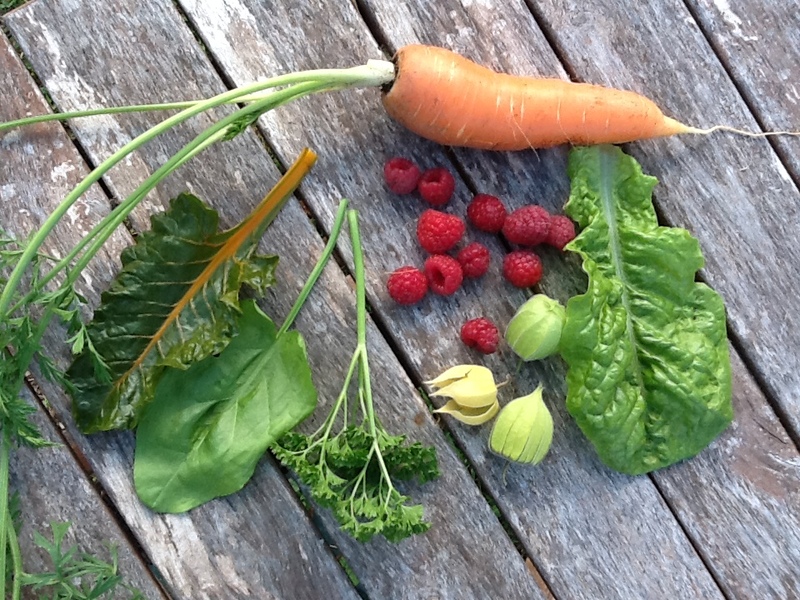 This is the first of a new series of Hilary’s “How to…” hands on garden tips & tricks. 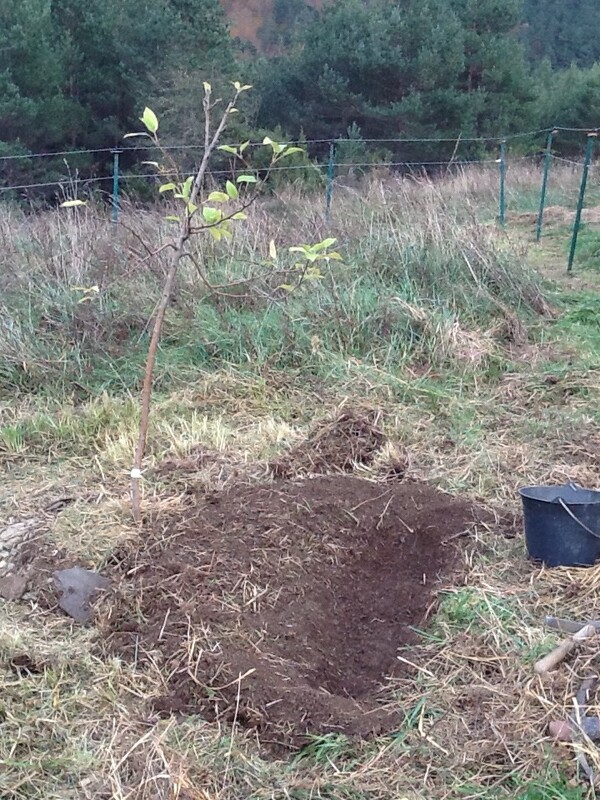 We’re kicking off with: planting an apple tree! 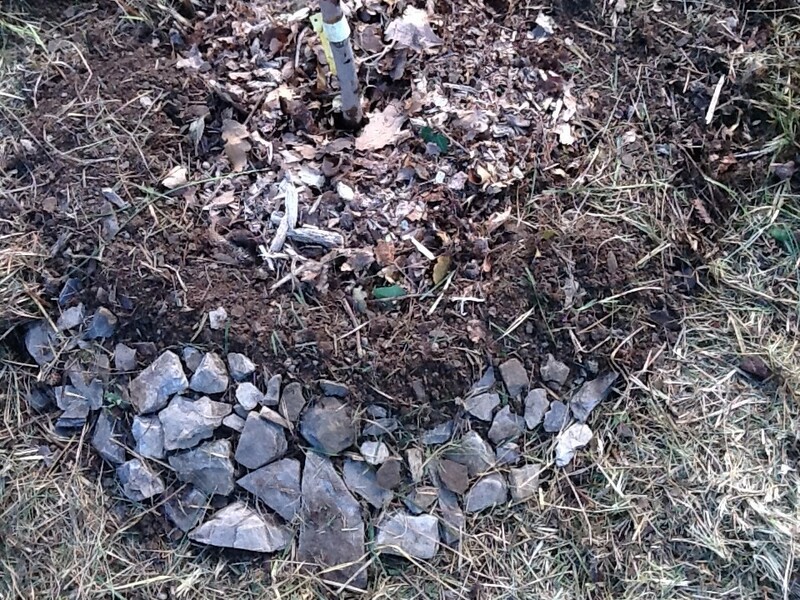 mulched it with material from the oak forest floor….. Ad on top, more forest floor litter. 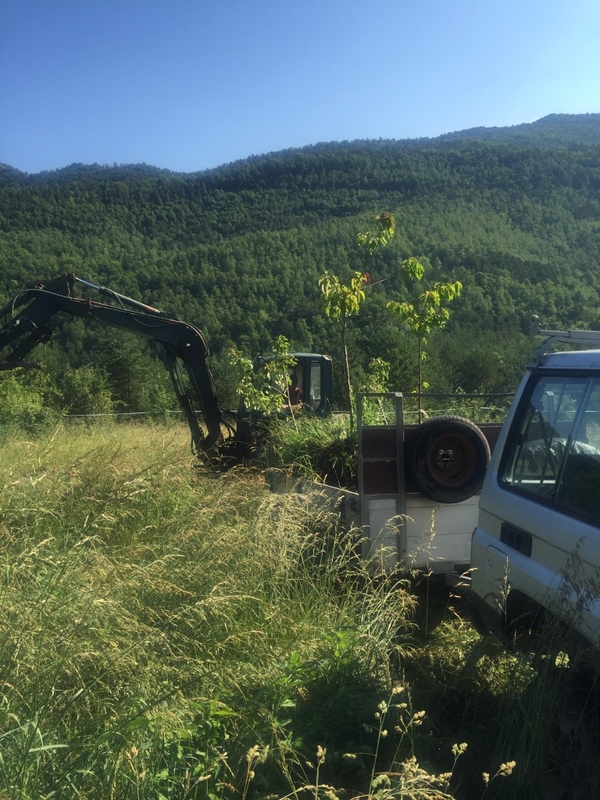 I banked up the soil on the downward slope side in order to retain rainwater for longer…. Time to stop for lunch! 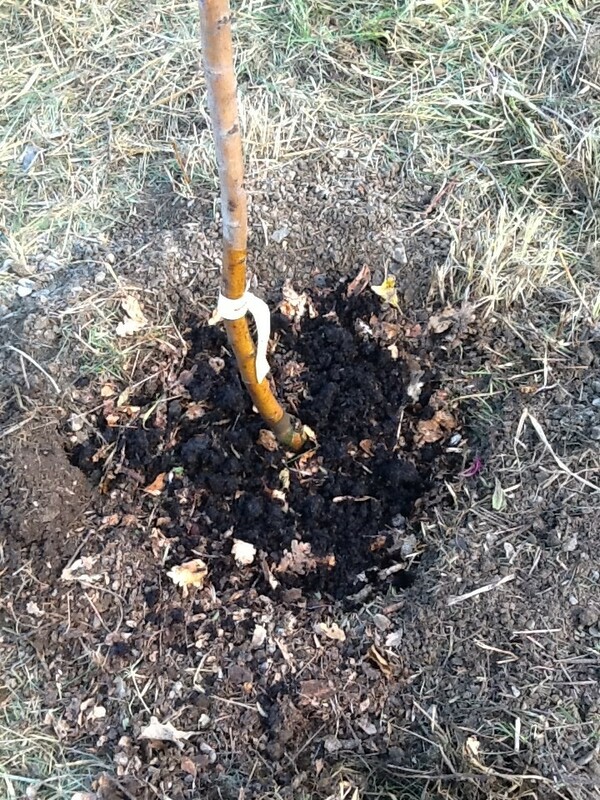 The trees are planted on contour but I’m checking here in order to dig a small swale behind the tree. 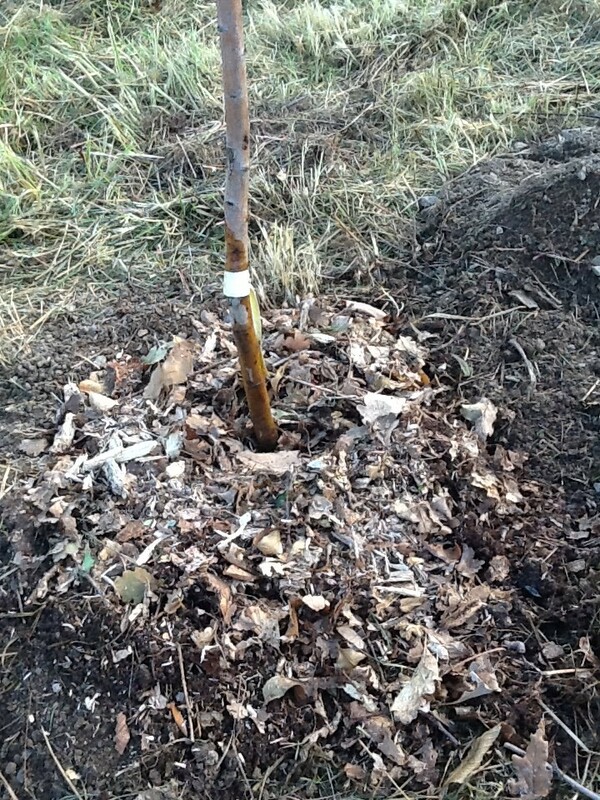 This will allow rainwater to soak in above the tree and so there will be less or no need to water it. 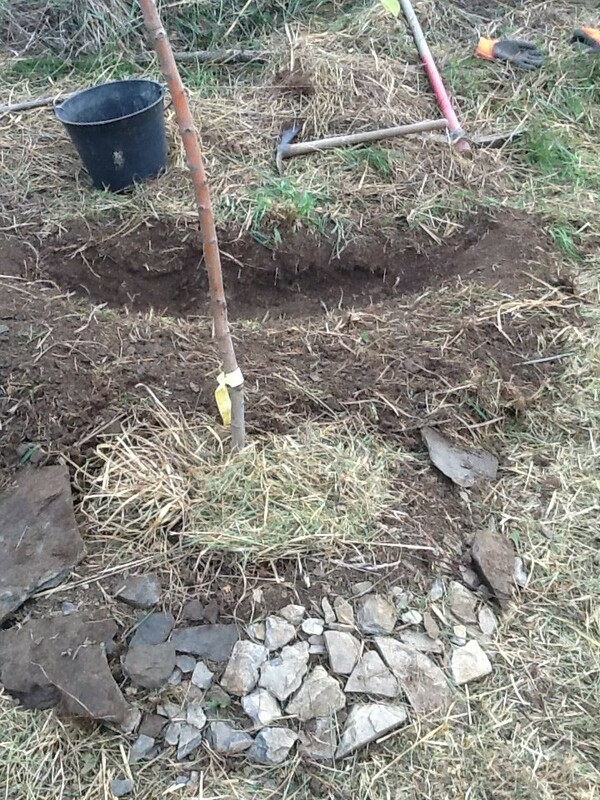 Digging the little swale on contour means the water won’t slosh out one end – permaculture is all about keeping water on your land as long as possible. Sinking it and spreading it is the key, making it work for you. Unfortunately we don’t have any big machinery (yet) otherwise a long swale running behind a whole row of trees would be good. But these small ones will do the trick for now. 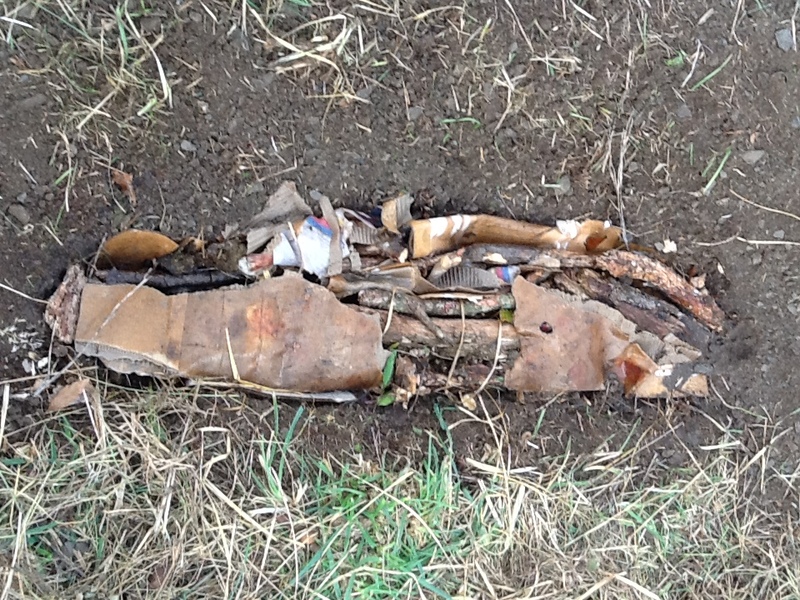 I like to fill Swales with absorbent materials which will soak up the rain and release it to the tree more slowly. 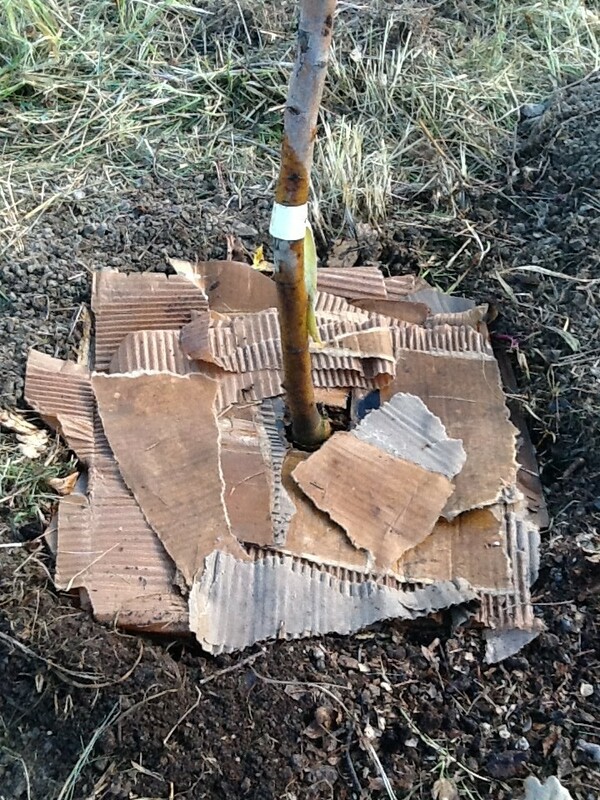 The rotting wood and cardboard mix, plus a small sprinkling of manure will also feed nutrients slowly to the tree. 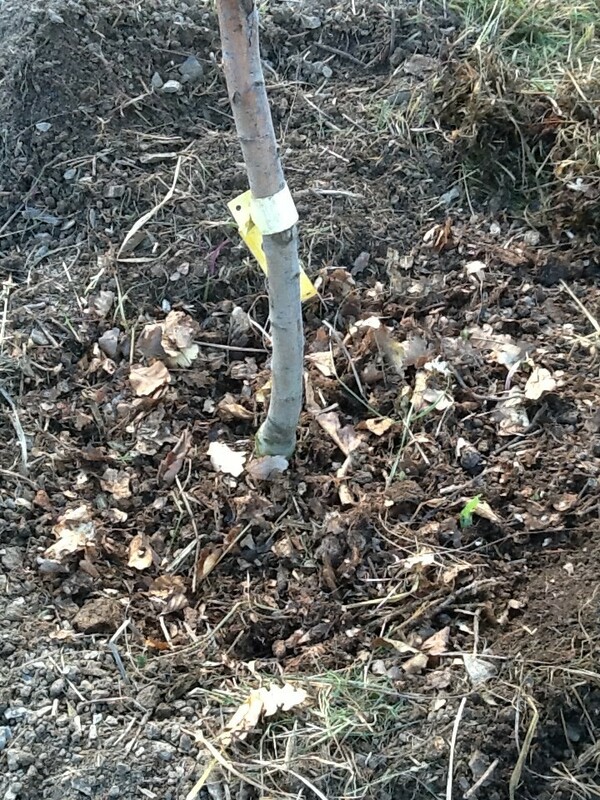 The rotting wood increases the fungal action near the tree which is the soil condition trees love best. 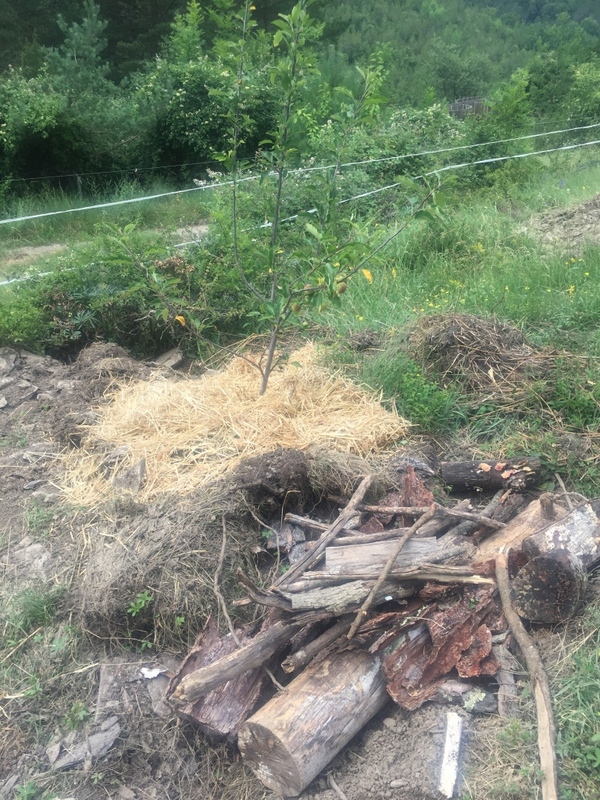 Finally I cover the ground around the tree and the swale with hay cut in the orchard. 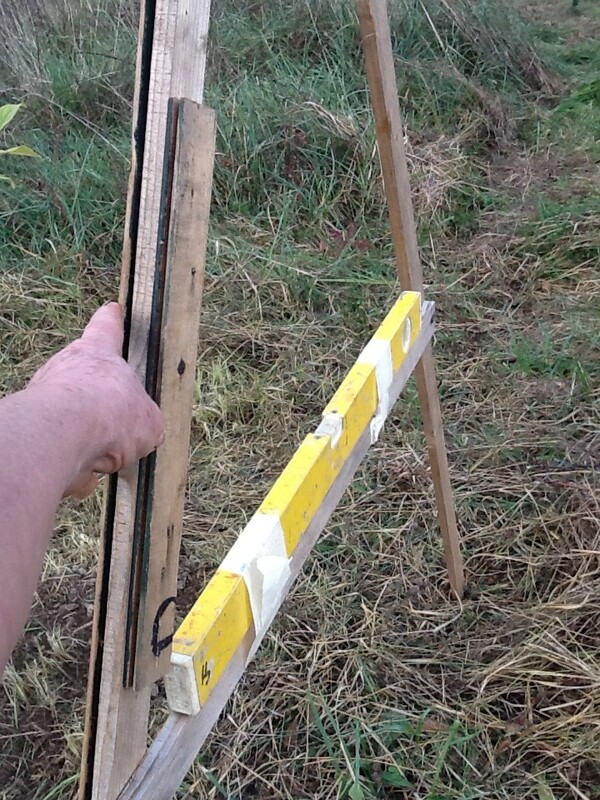 This was another piece of advice from our permaculture design course – wherever possible, use materials close to hand. 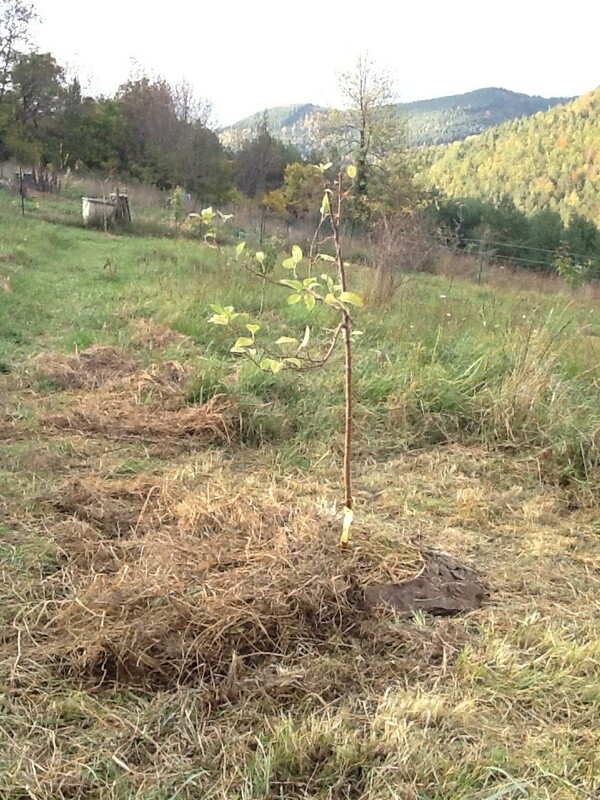 Good luck little tree.